Athens has threatened to arrest high school teachers if they carry out a strike this week, in a move seen as reassurance to Greece’s foreign bailout creditors that the country will not abandon its harsh austerity measures and unpopular reforms. The announcement marks the third time this year that the Greek government has invoked emergency laws to force strikers to return to work. Greece is due to receive €7.5 billion in loans soon, the latest tranche of a €240-billion rescue package signed in 2010; Athens currently has no money to pay pensions and wages. To cope with the personnel gaps, Athens plans to require two additional hours of work each week from high school teachers, and plans to transfer 4,000 of them to remote regions of the country. 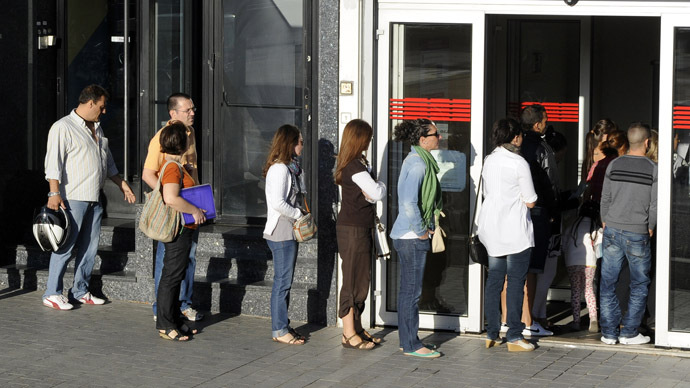 The government broke a longstanding taboo last month by agreeing to dismiss some 15,000 public-sector workers by the end of 2014, a key demand by the EU and International Monetary Fund for Greece to qualify for further rescue loans, Reuters reported. According to OLME, the union representing the teachers, about 10,000 part-time teachers could be dismissed once their temporary contracts expire. The union has called for a 24-hour strike when university exams start on May 17. However, under Greek law the government has the right to forcibly mobilize workers in the event of a civil disorder, natural disaster or public health risk. “This is a very authoritarian move from the government because it has issued civil mobilization orders for secondary education teachers in the public school system even before they decided to stage a strike during the university entry exams. Geek law is very explicit that civil mobilization refers to wars and natural disasters, not forms of civil protest,” Panagiotis Sotiris, sociology lecturer at the University of the Aegean, told RT. “It’s really interesting to see that one of the legal experts, who has insisted for many years on the unconstitutionality of these emergency laws, is no other than the current Minister of Justice in the Greek government, Mr Antonis Roupakiotis,” he said. Education Minister Constantine Arvanitopoulos justified the ban by arguing that students had a right to take exams without disruption; teachers will be served a civil mobilization order to go to work on that day, or risk arrest. “These threats by the prime minister and his government are directly against the overwhelming majority of workers and society,” Greece’s Syriza party, which opposes the bailout, said in a statement. 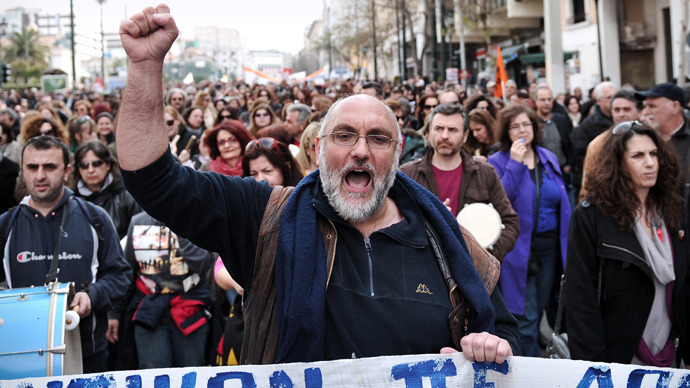 The Greek government has in recent months intervened frequently to shut down mounting anti-austerity strikes. Earlier this year, it interrupted week-long walkouts by local sailors that led to food shortages on Greece’s islands, and strikes by metro workers that disrupted transport in Athens. “The Greek government tries to meet the nominal terms of the bailout agreements in terms of budget cuts, reducing public investment of preparing lay off of thousands of public servants and public-sector workers of making extremely dangerous decisions, for example, there is no money currently for HIV tests for blood samples. The Greek government puts all the cost on Greek society in order to remain within the terms of the bailout agreements,” professor Sotiris told RT. 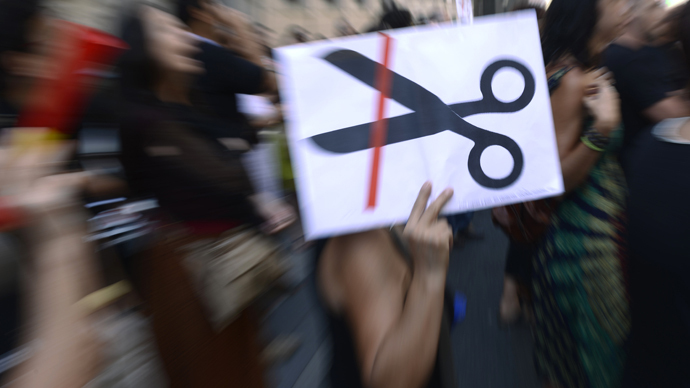 The Greek economy has been struggling to gain traction amid the austerity measures mandated in country’s bailout terms. Deep spending cuts and tax hikes have reduced Greece's budget deficit, but have also left the country stuck in recession, now in its sixth year. Last year, the financial crisis reached boiling point: It was feared that Greece would be forced to abandon the Euro currency used by 17 European Union nations, sparking a chain reaction in financial markets and further aggravating the eurozone debt crisis. According to the International Monetary Fund (IMF), over the last three years Greece has nonetheless made progress in bringing down its budget deficit, austerity has nearly tripled Greece's jobless rate since its debt crisis began in 2009. Greek unemployment is said to be more than twice the Eurozone average, with overall joblessness at a record high of 27 percent. Athens cut the minimum monthly wage for those under 25 years old by 32 percent to about 500 euros in a bid to boost hiring, but joblessness in the 15-to-24 age bracket recently soared from 59.3 percent in January to 64.2 percent in February. Morale has been particularly hard-hit in the crisis: The number of Greeks who attempted suicide has been on the rise in recent years. There were 677 suicide attempts in 2009, 830 in 2010 and 927 in 2011, according to official figures. A number of Greek pharmacists have also faced serious medicine shortages due to price controls and tight cash flows. “We are in a critical situation and we don’t know what’s going to happen even the next day,” pharmacist Dionysis Evgenidis told RT. Greeks in need often visit the Doctors of the World charity in Thessaloniki. RT’s Tom Barton spoke to patients who said they fear for their future. “I went to the pharmacy to buy injections for my baby but couldn’t find any so now that I’m unemployed I came here,” one desperate mother said. The highest risks are for those with serious health conditions like diabetes or cardiologic problems, who must receive treatment every day. “It’s very serious for them not to have their medicine. If they do not they could die,” Sofia Gorane, from Doctors of the World told RT.